The SpOmnibot is a robotic platform developed by Technische Universität München. You can read more about this in the paper “Real-Time Interface Board for Closed-Loop Robotic Tasks on the SpiNNaker Neural Computing System” (Christian Denk, Francisco Llobet-Blandino, Francesco Galluppi, Luis A. Plana, Steve Furber, Jörg Conradt) in Artificial Neural Networks and Machine Learning ICANN 2013. The robot is connected to the SpiNNaker board via a spinnaker 2-of-7 asynchronous link connected to the otherwise unused South-west link on chip (0,0). 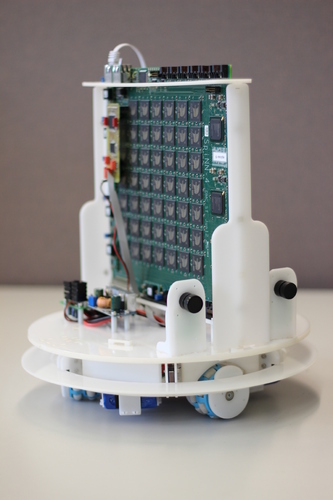 The robot is controlled by a small SpiNNaker interface board which contains a CPLD and an ARM microcontroller. The CPLD essentially translates between the 2-of-7 signaling used by SpiNNaker and a simple 9-bit binary interface (8 bits of data with extra signals for end-of-packet, req and ack) used by the microcontroller. The microcontroller communicates with the retinas and the robot’s motor controllers and other sensors via serial connections and exposes these peripherals via a multicast packet interface. LiPo charging mode, 2 cells in series 7.4V (2~3 hours). use 2xbanana to “power” plug cable. connect red/black banana plugs in charger output sockets. connect “power” plug to socket next to robot power switch. LiPo balanced mode, 3 cells in series 11.1V (10~12 hours). use (2xbanana + 4-pin plug) to 6-pin plug cable. connect 4-pin balance plug in 3-cell balance charging socket. connect 6-pin plug to small board on robot, next to large batteries. The IP of the SpiNNaker board is 172.16.1.2. The access point will assign your machine an IP in the same network upon connection (172.16.1.x).